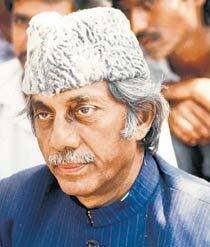 Mastan Mirza (1 March 1926 – 25 June 1994), popularly known as Haji Mastan, was one of the infamous trio of mafia gang leaders in Mumbai for over two decades from the sixties to the early eighties, the other two being Karim Lala and Varadarajan Mudaliar. In his prime days, Mastan operated a powerful smuggling syndicate in Mumbai and along the Gujarat coast and later diversified into film financing and real estate business. Mastan was a Tamil speaking Muslim, born in the Madras Presidency (now Tamil Nadu), but his family moved to Bombay (now Mumbai) when Mastan was ten. Mastan was known to be shrewd businessman and a cunning deal-maker. He always maintained cordial relations with the police and government officials and often brokered peace between rival gangs. Very early in his crime career, Mastan realized the importance of being seen among eminent personalities from politics and film industry as a symbol of power. Therefore he deliberately hobnobbed among the city's rich and famous and was frequently seen with Bollywood personalities at public functions. Mastan was arguably the most influential mafia don of his time. He was also seen as a "style icon" by many due to his extravagant lifestyle including immaculate white clothes, white shoes, white Mercedes car and expensive gold watches. Mastan deliberately flaunted an extravagant lifestyle to appear affluent and influential. He was good friends with his counterparts, Varadarajan Mudaliar and Karim Lala. Haji Mastan was born in 1926 in Tamil Muslim family Panaikulam, near Ramanathapuram, in the Madras Presidency, British India (now Tamil Nadu, India). He lived in the coastal town of Cuddalore, Tamil Nadu, before migrating to Bombay (now Mumbai). At the age of 8, he migrated there with his father. Mastan started doing odd jobs as a small boy in Crawford Market and later joined the dock and started working long hours in the dock as a small boy. In his early twenties, due to high import duty in gold, people started smuggling gold from overseas. As he was already working in the docks it made it easier for him to pass through it and then Mastan started his own business. Mastan began making a neat sum of money by diverting his sectors in business. At an early age he went on Hajj, and thereafter came to be referred as Haji Mastan. Mastan joined hands with Sukkur Narayan Bakhia, a smuggler from Daman to control the contraband smuggled into Mumbai and Daman from countries in the Persian Gulf. Mastan purchased properties at various locations in South Bombay including sea-facing bungalow at Peddar Road with his new-found wealth. He lived in a small room built on the terrace of his bungalow. Mastan ventured into film financing later in life, providing producers in Mumbai with much needed funds. He eventually turned into a film producer himself. He also had business interests in real estate, electronic goods and hotels. He owned several electronic shops in Musafir Khana near Crawford Market. Mastan maintained good relations with the other gang leaders. When inter-gang rivalry in Mumbai began increasing, he called all top gang leaders together and split Mumbai between the gangs so that they could operate without coming into conflict. Later in life, Mastan did not take a direct role in running his gang, instead he depended on lieutenants like Karim Lala and Varadarajan Mudaliar to carry out his smuggling operations and intimidate rivals and debtors. Mastan was especially close to fellow gangster Varadarajan as they both hailed from Tamil Nadu. When Varadarajan died in Tamil Nadu, Mastan hired a private chartered plane to bring his body to Mumbai for final rites. Mastan had many acquaintances in Bollywood such as Dilip Kumar, Raj Kapoor, Dharmendra, Feroz Khan and Sanjeev Kumar. During the Indian Emergency, he was imprisoned. Whilst in prison, he was influenced by the ideals of politician Jaiprakash Narayan and also began learning Hindi. After his release from prison , Mastan entered politics and formed a political party in 1980-81 and renamed it as Dalit Muslim Surakhsha Maha Sangh in 1985. Mastan died of cardiac arrest on 25th June 1994. Haji mastan had no children but he did informally adopt Sundar Shaekhar. Shaekhar runs Hussain's political party, now renamed 'Bharatiya Minorities Suraksha Mahasangh'. Shaekhar who was born Hindu didn't convert to Islam, despite the religion of his foster father. Nonetheless, Hussain reportedly nicknamed him "Suleman Mirza". The 1975 Bollywood film Deewaar was loosely based on Haji Mastan's life, with Amitabh Bachchan portraying a fictionalized version of him. Deewaar was later remade into a 1981 Tamil film, Thee, starring Rajinikanth in the same role. The 2010 film Once Upon a Time in Mumbaai was heavily based on Haji Mastan's life, although it was also partially fictionalized. Ajay Devgn portrayed the character of Haji Mastan (as Sultan Mirza) in the film, while Emraan Hashmi portrays underworld don Dawood Ibrahim (as Shoaib Khan). On 25 May 2017, it was announced Rajnikanth's forthcoming film will be Kala Karikalan (released 2018) which is believed to be based on Mastan. His foster son Sundar Shekar Mishra sent a notice to Rajnikanth when he learned of this. In response, Wunderbar Films issued a statement clarifying that the film is not based on Mastan's life. The 2013 film Shootout at Wadala in which Akbar Khan played the role of Haji Mastan as Haji Maqsood. ^ "When Tamil dons ruled Bombay". The Times of India. 2 November 2015. Retrieved 20 May 2018. ^ Singh, Naveeta (27 December 2007). "Aaquib Hussain's daughter serves legal notice on Don's 'adopted son'". dnaindia.com. Mumbai, India. Retrieved 20 May 2018.